Silver Diamine Fluoride (SDF) is an antibacterial liquid. The silver acts as an antibmicrobial. The fluoride promotes remineralization and the ammonial stabilizes high concentrations in solution. In August 2014, the Food and Drug Administration (FDA) cleared the first silver diamine fluoride product for use. Provides immediate relief from dentinal hypersensitivity. Hardens softened dentin making it more acid and abrasion resistant. Does not stain sound dentin or enamel. Severe early childhood cavities that is difficult to treat due to the child's young age. Patients with cavities that may not all be treated in one visit. A control restoration may be considered after SDF treatment. Patient has allergy to silver or fluoride. There are painful sores or raw areas on gums (i.e. ulcerative gingivitis or stomatitis). TOP PHOTO: Severe early childhood cavities prior to treatment involving upper incisors. 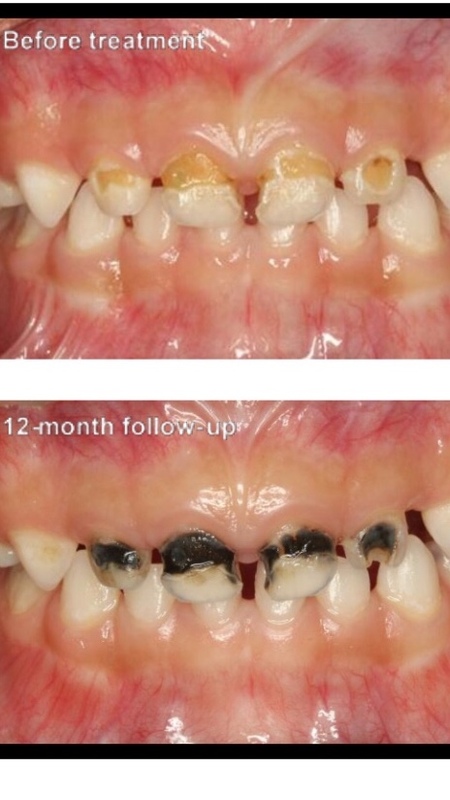 BOTTOM PHOTO: The appearance of cavities after treatment with silver diamine fluoride.